The day before publishing “Concerning Chemicals in Orbit Baby and Other Car Seats”, I reached out to Orbit for a response to the Ecology Center-Duke University study. Orbit’s website claimed its products were “Free Of Brominated Flame Retardants” and other concerning chemicals including TDCPP and TCPP. 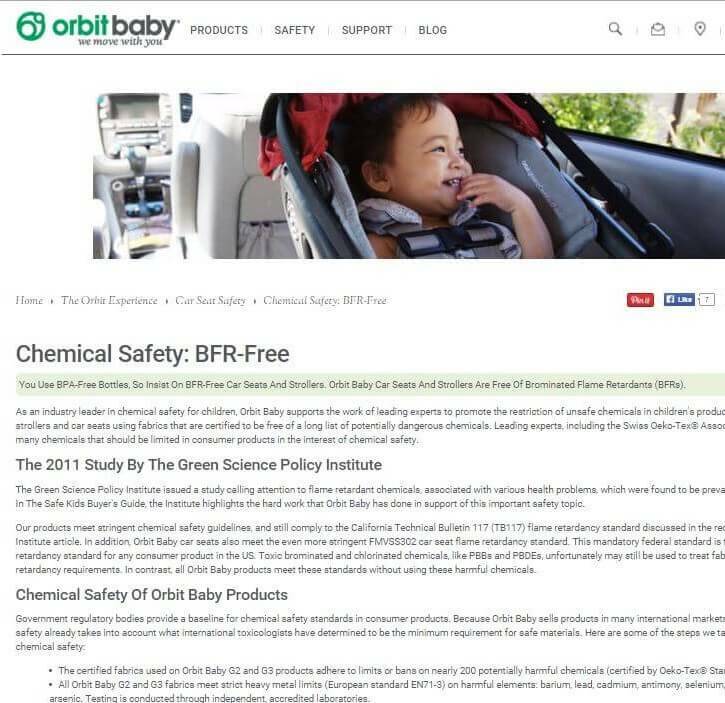 However, the Technical Report found an unidentified bromine compound and Chlorinated Tris (TCPP) in the Orbit Baby G3 convertible car seat. 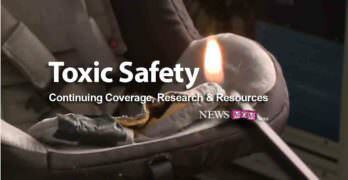 Orbit has alleged that our car seats tested positive for TDCPP due to external contamination. In the interest of full disclosure, we have uploaded our results and provided responses from industry experts. Click to jump to the data below. Two forms of Tris were removed from children’s clothing in the 70’s and are now listed as carcinogens “known to cause cancer” by the state of California. Yet six months after the Ecology Center published its report, the company had not responded to researchers and continued to claim its products were free of the chemicals. I then discovered that individual consumers, and at least one retailer, had informed Orbit a year before the Ecology Center study that their car seats tested positive for Tris. Orbit even agreed to buy back much of the remaining stock from one concerned retailer but continued to claim the car seats did not contain Tris. 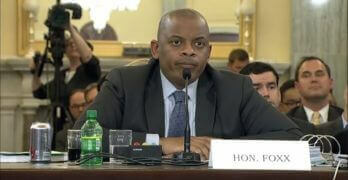 Thank you for the opportunity to respond to your blog post. We support the work of the Ecology Center and reviewed its report in detail. 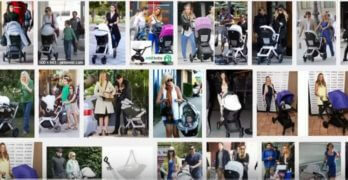 Given our strict standards and testing by third party certified laboratories, we were concerned to be mentioned along with numerous other Convertible car seat manufacturers. However, lab testing is a complicated matter in which test procedures are performed differently from lab to lab. Individual test results are not always indicative of all products due to many factors. 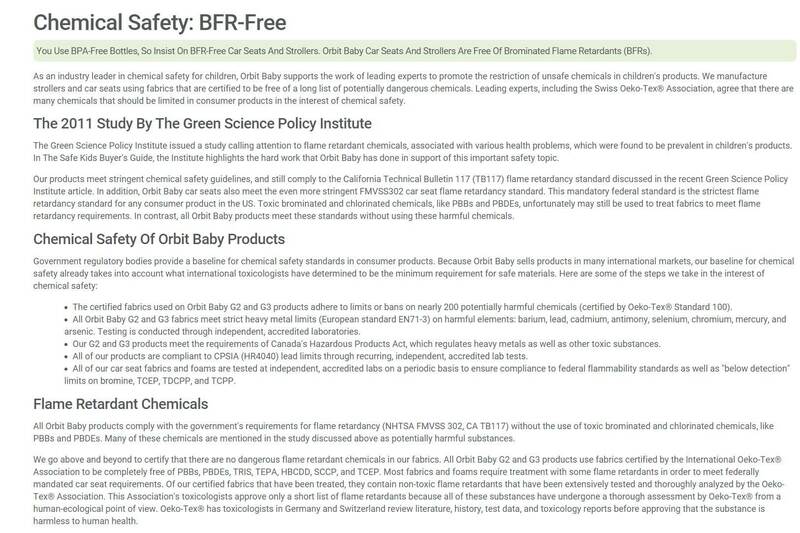 Orbit Baby requires our suppliers to follow a standard that prohibits halogenated flame retardants and specifically limits or restricts more than 100 different chemicals. To ensure that we continue to provide consumers with products that meet the high level of quality and safety they expect from us, we have further expanded our own testing and protocols to include sample testing conducted by our suppliers and additional testing by independent, accredited laboratories. Our rigorous standards require not only annual testing but multiple and random testing of numerous production batches. This means we are testing more of our products, more often. As parents ourselves, we take these reports very seriously. We appreciate the trust that parents place in our products to ensure the safety of the most important thing in their lives – their children. We always want to live up to our customers’ expectations. We encourage consumers to contact our customer care line with questions or concerns about our products at any time. In a follow-up email, I asked that Orbit respond specifically to the issues raised in the blog, including the fact that several consumers had their car seats independently tested and discovered that they also contained Tris. I requested that Orbit disclose how many consumers had informed them of positive test results and asked if they would offer refunds. 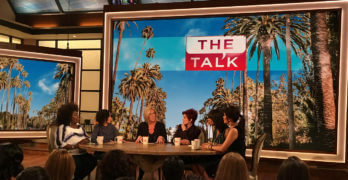 I also asked if they would provide me with a copy of their test results, if they would disclose which labs they use and if any of their tests had ever come back positive for “Tris or other halogenated flame retardants”. In addition to a couple of other questions about the company’s implication that its products are endorsed by the Green Science Policy Institute (something its founder denies), I asked Orbit if it could ensure that there is no TCPP in any of the Orbits currently on the market. I also asked if the company intends to change its marketing materials in light of the fact that TCPP has been identified in its products on several occasions. We always want our customers to be happy with their Orbit Baby products and encourage them to contact our customer care line if they have questions or concerns. 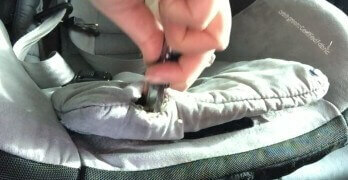 We have provided some refunds for our car seats on a case-by-case basis. All testing is conducted at globally recognized, independent accredited firms, including Intertek and SGS. Such reports are confidential because they contain proprietary product design information and other specifications. 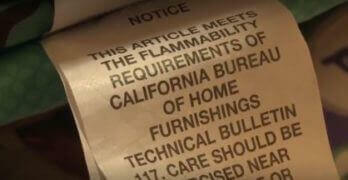 However, Orbit Baby follows many of the best practices recommended by the Ecology Center, including requiring our suppliers to follow a standard that prohibits halogenated flame retardants and specifically limits or restricts more than 100 different chemicals. To ensure that we continue to provide consumers with products that meet the high level of quality and safety they expect from us, we have further expanded our own testing and protocols to include sample testing conducted by our suppliers and additional testing by independent, accredited laboratories. Our rigorous standards not only require annual testing but also multiple and random testing of numerous production batches. This means we are testing more of our products, more often. We want to reiterate that we follow many of the best practices recommended by the Ecology Center. As parents ourselves, we take these reports very seriously. We appreciate the trust that parents place in our products to ensure the safety of the most important thing in their lives – their children. We stand behind our rigorous testing program that ensures our car seats meet or exceed applicable governmental guidelines for chemical safety. Later that day I noticed that Orbit had redirected this page on its site to another existing page and removed all references to the foam in its products. Did you switch to a new vendor during your G2 production and, as a result, is it true that your foam is no longer oeko-tex certified? Can you demonstrate that the testing preformed at either of the labs you reference in your response indicated that your products were free of detectable levels of BFRs, bromine, TCEP, TDCPP or TCPP? 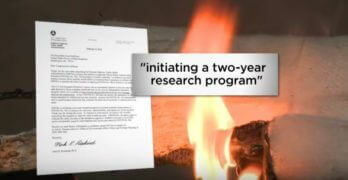 We’d be happy to accept a redacted report that shows only the test results with no proprietary information. 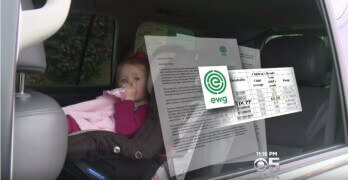 When were you first made aware that an Orbit car seat tested positive for TCPP? 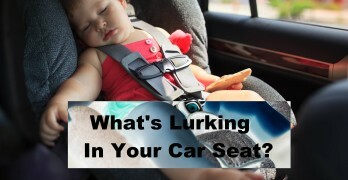 How many consumers have notified you that their car seats tested positive for TCPP? 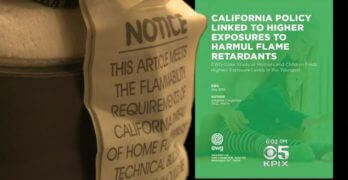 How many consumers have you refunded due to concerns about chemical flame retardants in their orbit? Have any of your lab tests ever detected any BFRs, bromine, TCEP, TDCPP or TCPP? 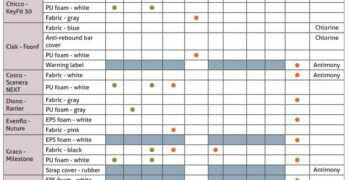 Does Orbit continue to assert that there are no detectable levels of BFRs, bromine, TCEP, TDCPP or TCPP in your product? Do you intend to change your marketing materials now that TCPP has been identified in your products on several occasions? We have provided all of the information that we can. The ongoing KPIX investigation later uncovered an even more concerning version of Tris in two other Orbit car seats, TDCPP. 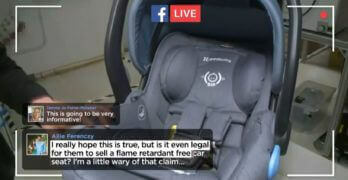 Months after that investigation aired, we were notified that Orbit told concerned customers that the KPIX car seats only tested positive for TDCPP due to “external contamination” by other products that may have come in contact with the car seat. To clarify, representatives from the Chemical Industry, the Green Science Policy Institute and Duke all confirm that it would be impossible for external contamination to contribute to the levels of TDCPP found in the Orbit car seats tested. 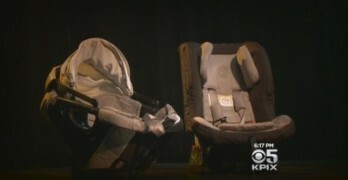 The car seats tested by KPIX were purchased in June and December of 2013, used for 6 months and 2 years respectively, and first sent in for testing in December of 2015. 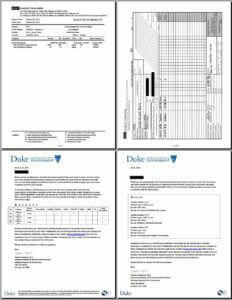 Duke’s test results only confirm the presence of chemicals found at more than 1% by weight. However, the follow up confirmatory tests performed by Paradigm and STAT laboratories specify the exact amount of TDCPP found in each sample. The testing was performed using one of the same testing methodologies (EPA 3550C) that Orbit is required to use per the terms of this settlement (page 2). The settlement was reached after Orbit was served with a Notice of Violation for failing to warn customers of the presence of TDCPP in its products in 2013. 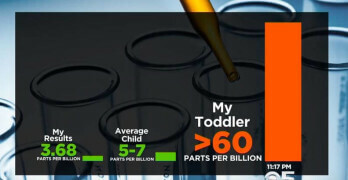 The lab results for our tests were given in parts per million (STAT) and parts per billion (Paradigm). 10,000 ppm or 10,000,000 ppb equals 1% TDCPP by weight. 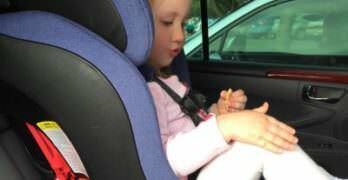 The Paradigm results (PDF Pages 1-5) found 5.5% and 6.2% percent TDCPP by weight in the samples of our car seats tested. 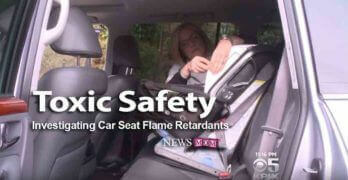 The STAT results (PDF Pages 6-10) found 6.7% and 6.3% percent TDCPP by weight in the samples of our car seats tested. 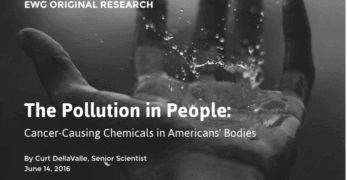 To investigate the allegations that a sample of foam could test positive for TDCPP at 6% by weight due to after-market eternal exposure, we reached out to Duke, the Green Science Policy Institute and The American Chemistry Council. 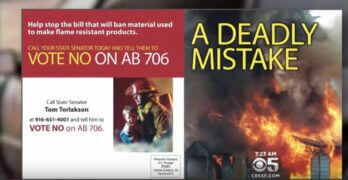 The findings of this 2011 paper by Duke’s Heather Stapleton, published in the journal Environmental Science & Technology, indicate that, on average, when flame retardants are added during production, baby products and car seats test positive for the retardants at 4-5% by weight. 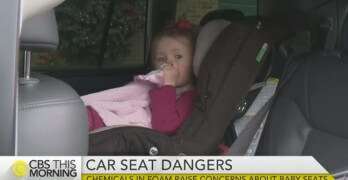 The Orbit car seats tested positive for TDCPP between 5.5-6.7% by weight indicating they contained more of the chemical than the average product tested. – Blum’s research was the catalyst for removing TDCPP from children’s pajamas in the 70’s. 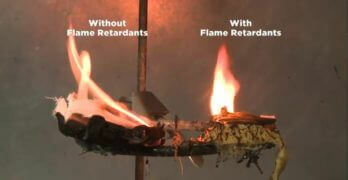 – The American Chemistry Council represents flame retardant manufactures. 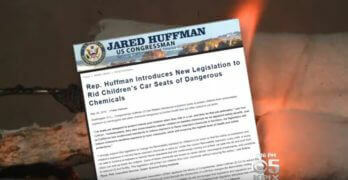 Are these chemicals found in the stroller seats as well?